Achieving cooperation in natural resource management is always a challenge when incentives exist for an individual to maximise her short term benefits at the cost of a group. We study a public good social dilemma in water infrastructure provision on land reform farms in Namibia. In the context of the Namibian land reform, arbitrarily mixed groups of livestock farmers have to share the operation and maintenance of water infrastructure. Typically, water is mainly used for livestock production, and livestock numbers are subject to high fluctuations due to the given environmental conditions. Our paper assesses how alternative payment systems with differing congruence of provision and appropriation support the cooperation in the group given the ever-changing equilibria. In a first step, we conducted an exploratory overview of the social-ecological system of central Namibian land reform projects. The Social Ecological System (SES) Framework served as a guideline for this assessment (Ostrom 2009). Taking the complexity of the cooperation situation into account, in the second step we designed a role-play that is based on a social-ecological simulation model. The role-play simulates the real-life decision situations of land reform beneficiaries wherein equilibria are permanently changing. This approach helped us to not only better understand the cooperation challenges of Namibian land reform beneficiaries, but also supported stakeholders in their decision making and institution building. Our study provides evidence to support that land reform beneficiaries increase their contributions as they own more livestock and as other group members increase their payments. Nevertheless, only groups with relatively homogeneous livestock endowments manage to agree on payment rules. Interestingly, the dominant rule is an “equal payment per farmer” and not a “payment per head of livestock”, though the latter would imply a higher congruence of provision and appropriation. Does the level of cooperation regarding group water-infrastructure provision on neighbouring Namibian land reform farms depend on the character of payment rules – more specifically, the congruence of appropriation and provision? We study our research question in the context of the Namibian land reform. For more than 18 years, land has been redistributed to previously disadvantaged groups of the Namibian society using a broad range of instruments, such as group resettlement, subsidized loans, redistribution of government land and, in a few cases, expropriation. In this paper, we focus on the Farm Unit Resettlement Scheme (FURS) which is based on the willing-seller willing-buyer principle. The Namibian state uses preferential acquisition rights to purchase suitable agricultural land whenever any owner of such land intends to dispose of it (RoN 1995). The Ministry of Lands and Resettlement divides the farms into smaller units and any Namibian citizen who has been socially, economically or educationally disadvantaged by past discriminatory laws can apply for an allotment of such units for resettlement (e.g. RoN 2002). The research question is highly relevant in the FURS setting as there are hardly any permanent open water sources in Namibia. Farmers have to pump ground water for their livestock with diesel or wind pumps. A breakdown of water infrastructure leads to livestock losses and significant costs. If water infrastructure breaks down, farmers are forced to ask for water access at neighbouring farms. Usually fees need to be paid for such water access, and longer routes to water points contribute significant stress to the animals. According to the lease agreements, the government is responsible for the maintenance of the infrastructure. Nevertheless, there are unclear responsibilities between ministries, and authorities are very slow to respond to infrastructure breakdowns. Therefore, it is generally more cost efficient for farmers to repair the infrastructure themselves than to bear the costs of waiting for government assistance. Farmers make no payments to the government for the maintenance. For the self-organised infrastructure management no formal fee collection rules are specified. If FURS farmers form Water Point User Associations they are supposed to have an association bank account according to the by-laws. But in general the groups can decide themselves how to collect money and how to pay the actual maintenance expenses. Maintaining water infrastructure is a collective challenge for FURS farmers. This fact is strongly shaped by the process of land redistribution. The splitting of larger farms, that were previously centrally managed, into smaller farm units means that beneficiaries do not have exclusive access to water infrastructure. The sharing of water infrastructure is emphasized in the lease agreement. FURS beneficiaries are forced to cooperate with their neighbouring farmers on a farm cluster. They enter the cooperation arena solely on the basis of bureaucratic decisions. They have no say as to whom they cooperate with, do not know their future cooperation partners, and, therefore, cannot rely on a history of social interaction. Given this situation, the main water governance challenge for the farmers is the decision how much each of them contributes to infrastructure maintenance. There are two typical operational rules in the research region with regard to contributions to water infrastructure maintenance. Either farmers pay an equal fixed amount or they calculate a fee per head of livestock (Bock and Kirk 2006; Falk et al. 2009). Both payment systems have their advantages and disadvantages. The fixed payment per farmer is easy and transparent to calculate. It does not, however, reflect the unequal appropriation of water. Livestock is the main consumer of water in central Namibian farming systems and is highly unequally distributed amongst the farmers. The fee per head of livestock supports congruence of provision and appropriation which according to Ostrom (1990) increases the likelihood of successful cooperation. This is most likely also the reason why this payment system is strongly promoted by the Ministry of Agriculture. Nevertheless, the livestock based system requires a regular adaptation of the individual payments. Livestock numbers vary considerably between farmers and change permanently due to multiple dynamics within the SES. It is not easy to assess each other’s livestock numbers on relatively large and densely vegetated farms. Direct or indirect monitoring of water appropriation is costly; therefore, a payment system which achieves congruence of provision and appropriation is associated with higher transaction costs. It has to be emphasised that this paper is not intended to summarize the historical and political background of the Namibian land reform. We provide more background information in Appendix 1 and refer otherwise to more comprehensive assessments such as Werner (1993), Kaukungua et al. (2004), Werner (2004), LAC (2005), Werner and Kruger (2007), RoN (2010), Werner and Odendaal (2010). This paper focuses on one particular challenge of FURS beneficiaries namely the management of shared water infrastructure on small scale clusters of land reform farm units. In our sample a cluster consists of up to six units and has a size between 750 ha and 4.600 ha. The farmers lease the land from the government. They receive farm income mainly from meat production and enjoy a lifestyle which is much romanticised in Namibia (Falk et al. 2009). We study specifically the choice of a payment system to achieve water management cooperation. In a first step towards answering our research question, we conducted an explorative assessment of our case based on the Social-Ecological-System (SES) Framework of Ostrom (2009) (see Appendix 1). The framework based assessment helped us deepen our general understanding of the complexity of the system. In the application of this approach, we benefited from ten years of interdisciplinary collaboration within the Biodiversity Monitoring Transect Analysis in Southern Africa (BIOTA) Project. The joint work of social and natural scientists contributed greatly to offering a more holistic answer to the research question. It was, however, not the objective of this research to describe the full complexity of the interactions of human and natural systems of FURS farms as one might expect in some schools of system research (see e.g. Foran et al. 2014). Our behavioural study follows the approach of taking into account diverse system features when interpreting causal relationships between asset heterogeneity, rule definition and group cooperation. As such, the explorative assessment forms the basis for theoretical considerations on the collective infrastructure provision challenge of FURS farmers. In a next step, we introduce a rangeland ecosystem model, which was linked to the land users’ decisions on water infrastructure management. In this way a role-play design emerged based on a computer-simulation model. The role-play design allows us to capture resource dynamics in studying collective action. Janssen (2010) emphasises the need to increase the relevance of behavioural experimental approaches by strongly taking into account system dynamics. As such, we believe to supplement more standardised and often static experimental research. However, adding complexity to the game also has some disadvantages. It becomes, as in real-life, more difficult for the players to understand all relations between different system variables. As a consequence, it is impossible to control for all interactions. The game, therefore, only produces relevant knowledge if it offers a sufficiently close representation of the real-life decision situation. Research was conducted in the Omaheke region in east central Namibia (Figure 1). The vegetation is dominated by an Acacia-Terminalia tree-and-shrub savannah of the Central Kalahari (Mendelsohn et al. 2002). FURS land reform beneficiaries in our sample, farm with livestock, mainly cattle, and operate in a commercial farming setting. The farm unit clusters are clearly marked and fenced. FURS farmers are allotted individually fenced shares of the cluster. The size of studied individual farm units ranges between 50 and 2000 ha which is far below the average of commercial farm sizes in Omaheke (Olbrich 2012). Map of Namibia and Omaheke region. Source of data: Mendelsohn et al. 2002. Table 1 summarizes the basic descriptive statistics of our sample. The majority of respondents (82%) use the farm units for more than 4 years. This means they have already had considerable time to develop infrastructure maintenance rules. Descriptive statistics of sample (the game was played with 45 farmers, but for two of them not all socio-economic data could be collected). In the following section we present a summary of some theoretical considerations related to the challenge of water provision cooperation in Central Namibia. Our model aims at drawing theoretical hypotheses regarding farmers’ contributions and free ride incentives in the management of water infrastructure. A more detailed description on our theory and the connected assumptions is given in Appendix 2. Proposition 1a: A group will contribute to the maintenance of their water infrastructure, if the group opportunity costs OCN are higher than the group’s total contributions CN. Proposition 1b: An individual will contribute to the maintenance of their water infrastructure, if her opportunity costs OCi are higher than her contributions Ci. Proposition 2: Farmer i’s contribution is negatively correlated with the contribution of other farmers in her group. When a short-sighted strategic farmer i computes her optimal decision, neglecting future interaction and not holding other-regarding preferences, she takes the contribution of other farmers as given. Any additional payment of farmer i increases the survival rate of the water infrastructure which is beneficial to all farmers in the cluster. If farmer j raises her contribution, farmer i will strategically reduce her contribution to the group water fund. This behaviour conflicts with the inequity aversion concept of Fehr and Schmidt (1999) and conditional cooperation of Fischbacher and Gächter (2010). Proposition 3: The larger the number of livestock of a farmer, the greater her contribution into the water fund. Proposition 4: The payment system with equal contribution per farmer i is stable in groups with homogeneous endowments. It is less stable in groups with heterogeneous endowments. Propositions 2 and 3 predict that poorer farmers, in terms of livestock, will expect wealthier farmers to contribute more to the water fund. An equal payment would deviate from the optimal reaction, thus, from the equilibrium, when livestock numbers are unequal. From propositions two, three and four it follows that heterogeneous groups, in terms of livestock endowment, are, in equilibrium, more likely to choose the rule payment per head of livestock. The explorative SES assessment made us aware that water provision cooperation by Namibian land reform beneficiaries has to be achieved in systems of high dynamic complexity. Amongst others, these are marked by permanent and often delayed changes, multiple feedbacks at different speeds, nonlinear relationships of variables, and often irreversible developments (Sterman 2001, 2006; Barreteau et al. 2001). The systems are reflexive, acting on decision makers who, through their actions, affect various components of the system (Bousquet et al. 2002). More specifically, we learned from the explorative SES assessment that complex system interactions create strong dynamics of total and relative livestock numbers. In summary, we expect that a payment system which is linked to livestock numbers and achieves stronger congruence of provision and appropriation is more stable in maintaining group cooperation. Acknowledging the complexity of social ecological systems initiated the debate on how to decide which variables should be included in particular studies. Catalogues of third tier SES framework variables collected from various studies quickly contain hundreds of variables. There is a common understanding that only such variables should be taken into account which are relevant for a particular study. The explorative SES assessment helped us to identify relevant control variables. Especially for the quantitative analysis another selection criteria has been important. We included only such variables in our analyses which show a considerable variance across our sample. With our study design we cannot make any statements about the importance of features of the SES which are identical across our sample. Such variables can still have a strong impact on cooperation patterns. Good examples are historical or political factors. We provide in the introduction and in Appendix 1 some context information on such variables. In order to answer our research question and test our theoretical propositions, we decided to use role-plays. Role-plays can be used to achieve multiple objectives. They help us to acquire knowledge, validate models, support farmers’ decision making and negotiation processes, and develop institutional capacity (Barreteau et al. 2001; Bousquet et al. 2002). Our role-play is based on two models. On the one hand, we followed the logic of the theoretical model described above. On the other hand, we used an ecological-economic-simulation model in order to capture the ecological interactions and dynamics of the system (Lohmann et al. 2014). The combination of both models simulates the complexity and dynamics of important parts of the social-ecological system in the context of water provision on Namibian FURS farms. The resulting role-plays created a virtual world in which farmers could experiment, rehearse decision making, and play in a compressed time and space (see also Barreteau et al. 2001; Sterman 2001, 2006). The model provided them with immediate feedback and allowed them to adjust decisions. Experimenting with the simulation model induces much lower costs and risks for the players than a real-life trial and error process of institutional change (Barreteau et al. 2001; Sterman 2006). Compared to standard experiments, this approach has a number of obvious disadvantages. The internal validity is low as it is difficult to control many parameters. As a consequence the results are difficult to compare (Bousquet et al. 2002). The role plays are not suitable for testing general theoretical hypothesis. Generating accepted scientific evidence requires controlled experiments which discriminate between hypotheses and produce replicable results (Sterman 2006). Nevertheless, the more complex the phenomenon, the more difficult it is to draw conclusions from standard experiments on real life decision situations. The advantage of the simulation-model based role-plays is a higher external validity and a more realistic reproduction of real-life decision situations (Barreteau et al. 2001). The objective of the role-play games is to assess a representation of reality rather than to study a theoretical pre-given one (Bousquet et al. 2002). As a starting point for developing our role-play, we used an existing vegetation model (Tietjen et al. 2010) and parameterised it for environmental conditions in the Omaheke region of Namibia. The model simulates the dynamics of natural resources depending on environmental conditions (climate, hydrology, ecological interactions) and land use impacts. For details see Lohmann et al. (2012, 2014), Appendix 3, and Supplementary Appendix. Resource dynamics derived from this model were dynamically linked to a social-economic model based on our theoretical model (Appendix 3). Specifically relevant for the given question here is the fact that the livestock numbers in the model responded to the vegetation state, the health of the animals as well as off-take decisions. The vegetation state, again, depends on external factors such as random rainfall, but also on the stocking rate. From a land users perspective this framework represents the highly unpredictable and complex dynamics of the real-life social-ecological system. 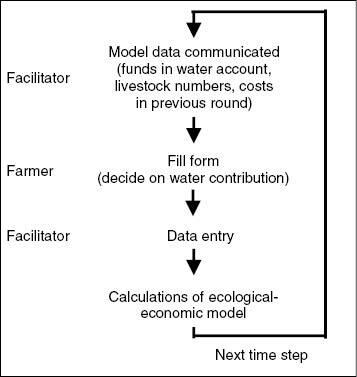 The combined ecological-economic rangeland model was then converted into a computer based role-play of basic farming decisions and, in particular, the voluntary contribution to the group’s water provision. We designed a user interface that allows for the communication between a facilitator and the model. The interface presents an output of all state variables and allows for a subsequent input of the farmers’ decisions. We communicated the initial ecological and economic model states using photographs and simple lists in the respondent’s mother tongue. Based on this illustratively communicated information, farmers made decisions regarding their stocking rates as well as their individual contribution to the maintenance of water infrastructure (i.e. the amount of money to be paid to a water fund) (see the interface and illustrations in the Supplementary Appendix). The role-play starts with an individual and group account balance of zero. Each player is given a herd and farm size representing the respective real-life values from the farms as given in 2008. Animals and vegetation are in a good and above average state and the water infrastructure is functioning at the beginning of the game. the account balance of the group’s water fund at the beginning of the role-play period. In each round the players can make two independent decisions: 1) they can buy or sell livestock and 2) they can choose an amount to pay from their individual account into their group’s water fund. Both decisions are made simultaneously. The role-play is set up in such a way that all players have the opportunity to continuously communicate face to face as this is the most efficient form of communication for developing institutions (Balliet 2010) and is a realistic representation of the real-life situation.3 We did not restrict the time the players could communicate. Furthermore, the players had the opportunity to find out the decisions of the other players. This strategy was chosen because fellow farmers can in reality talk to each other and we did not intend to provide another evidence for the fact that communication supports cooperation. After all players have made their decisions, new ecological and economic states (e.g. condition of livestock and account balance) are calculated by our simulation model. These new states are again the basis for decisions in the next round of the game. Figure 2 illustrates the role-play process. The cyclic process of the role plays. The modelled water-infrastructure costs vary from year to year, reflecting randomly appearing maintenance costs. In the role-play, each group shares water infrastructure, which consists of one diesel and one wind driven pump. The costs are modelled on the basis of expert interviews with an annual average cost of N$ 2350 (σ=785) for the diesel driven pump and N$ 750 (σ=250) for the wind driven pump. Players were not informed at the beginning of the game how we calculated the maintenance costs. We told them, however, that there is a setup of two pumps and that costs are based on expert estimates of real-life costs. They were further told that the costs randomly vary from period to period in the game. Previous experiences of the players and specific differences between the farms may affect the decisions on the amount to be paid into the water fund especially in the first periods of the game. We hope to capture this noise in our data analysis by controlling for the highest maintenance costs in the previous rounds of the game. In addition, we control for farming experience and training received. Further, we separately analyse the second half of the role-plays when we assume they have learned approximately how high the maintenance costs are in our game. Throughout the game, farmers were not informed about the periods’ water costs before making their contribution; therefore, they have to make decisions under uncertainty. In the case that the money available in the fund is insufficient to cover the maintenance costs, the infrastructure breaks down. In this case the players had to pay a fee of N$ 50 per head of cattle. The amount represents the opportunity costs in our theoretical model. It is based on interviews with farmers even though, in reality, there is a lot of variation. The opportunity costs were announced at the beginning of the game; therefore, players could calculate them for each round throughout the game. We conducted the role-play sessions between January and April of 2009. The research team cooperated with the Emerging Commercial Farmers’ Support Programme (ECFSP), which provided lists of all land reform farms in the Omaheke Region. By the time of the research there were 196 Farm Unit Resettlement Schemes (FURS), and 45 of them (23%), sharing 14 farm clusters, were included in the study.4 The selection of participants was not random, but predetermined by the accessibility of beneficiaries. It happened only once that a respondent declined to participate in the study. In most of the cases, if farms could not be included in the study, it was impossible to establish contact with the farmers. This means that we probably have a bias towards full-time farmers even though the team arranged interviews with part-time farmers outside of their farms in order to reduce this problem. It should be mentioned that the research area is relatively large (84.981 km²) and that the team drove up to 300 km every day, on dirt roads, to visit the farms. The small sample as well as the sample selection process has to be taken into account when interpreting our results. In an attempt to simulate the real-life cooperation situation, the role-plays where played among groups of farmers who in fact share a water point. This also means that for each game the group size varied from between two and six players. The role-plays took between one and three hours. Participants did not receive any game related payments. For the data analyses, we used the standard deviation of payments to identify groups agreeing to a rule. If the group’s standard deviation of water payments was zero in a specific period of the role-play, we concluded that the group was following the rule of equal payment per person. If, in a specific period, the group’s standard deviation of water payments when divided by livestock numbers was zero, we concluded that the group was following the rule of payment per head of livestock. The role-play data was analysed using regression models. We used a hierarchical mixed-effects regression model in STATA 12. This allowed us to control for variables on different scales. As such, we considered individual layer and group-context layer information. Using simple correlation analysis reveals that 38% of our players increase their payments if the other group members also increase their payments.5 Thirteen per cent of the sample adjusted their payments to their share of the group’s livestock herd. The payments of another 6% of the players correlated with both the payments of the other players and their livestock share. This is possible if there is a relatively stable relation of livestock numbers amongst the group members. The payments of 42% of the players correlated neither with the other group members’ payments nor with their share of the livestock herd. We do not observe consequent free riding as all players contributed to the maintenance of the water infrastructure. In 86% of the decisions the individual payments are lower than the costs for using the neighbours’ water source. In 92% of the decisions, the total opportunity costs of all group members are higher than their total contributions into the water fund. The sum of payments for the whole game is always higher than the total group opportunity costs. On the individual level there are still, however, 5 individuals (11%) wherein their total game payments exceed their opportunity costs. As such, Proposition 1a and 1b are confirmed, albeit with a few surprising exceptions. Analysing the role-plays’ contributions using regression models (Table 2) allows us to reject Proposition 2. In none of the models we observe a negative relation between farmer i’s contribution and the contributions of other group members. The Mixed-effects model, covering all game rounds, indicates that players increase their payments if the other group members increase theirs. This could be interpreted as inequity aversion (Fehr and Schmidt 1999) or conditional cooperation (Fischbacher and Gächter 2010). Regression models explaining the natural logarithm of the individual player’s payments for water infrastructure maintenance (*p<0.10, **p<0.05, ***p<0.01, ****p<0.001). Our results confirm Proposition 3. The players adjusted their payments to represent their livestock numbers. This indicates that farmers act on implicit norms of congruence of provision and appropriation. The players largely failed, however, to formalise these norms. The rule of payment per head of livestock, which guarantees the highest congruence of provision and appropriation, was unpopular amongst our players. Only one group switched, in the course of the game, from equal payment per person to payment per head of livestock. Another group agreed, at the beginning of the game, to the rule of payment per head of livestock, but in round two one player defected and the cooperation could not be re-established. Five groups agreed to the rule of equal payment per person. Overall, six out of 14 groups agreed to follow a clear payment rule consistently throughout the game. Five groups cooperated from the first round, and one group started to cooperate after round four. In reference to Proposition 4, we cannot confirm that adopting the rule of payment per head of livestock was positively correlated with the variance in livestock endowment within groups. Table 3 indicates that groups with less variance in livestock endowments were more likely to come to an agreement on a payment rule. In contrast, groups with a greater variance in initial livestock endowments often failed to provide sufficient funds in order to avoid an infrastructure breakdown. Nevertheless, players who were confronted with situations of unequal livestock possession were more likely to adopt an implicit norm of congruence of provision and appropriation. In contrast, the implicit norm of adjusting payments to other group members’ payments was more frequently observed in groups that closely resembled a homogeneous livestock endowment (Table 3). Cross-tabulation showing the frequency of rule choice depending on the quantile category of the Gini-coefficient of the group’s livestock possession. Our regression models (Table 2) provide evidence that groups agreeing on a payment per head of livestock made higher payments than groups agreeing on no rule. In a similar way groups adopting the equal payment per person also paid more. The models confirm that in the face of higher variance of livestock endowments within groups, adopting the rule to pay per livestock does not increase payments (see interaction term, Table 2). The models for the overall game even indicate a negative relationship. Correlation analysis indicates that players who consciously agreed to the payment system per person made larger water contributions than players who informally adjusted their payments to the payments of other players (Pearson r=0.566, p=0.014, N=18). Also players who consciously agreed on a payment system per head of livestock tend to make higher payments compared to players informally adjusting their payments to the distribution of livestock within the group (Pearson r=0.551, p=0.099, N=10). Nevertheless, the people formally following a rule and the ones informally following a norm had similar overall water expenses per livestock unit (individual payments plus breakdown fees) (P-values for two-tailed t-test are 0.36 and 0.18 for payment per person and payment per head of livestock respectively). It is interesting to note that farmers with smaller livestock numbers have been more reluctant to explicitly commit to any rule (Pearson r=–0.3911, p=0.008, n=45). Mainly owners of larger herds formalised the rule of equal payment per farmer while owners of smaller herds rather adjusted their payments informally to the other players’ payments (Pearson r=0.4691, p=0.050, n=18). One should keep in mind that in groups with heterogeneous livestock ownership the farmers with large herds are favoured by the equal payment per farmer. Having learned about the payment behaviour still leaves the question open whether the rule formation had an impact on the ecological and economic outcomes of the farmers in the games. We count together the individual payments into the water fund and the individual fees paid in cases of infrastructure breakdowns. These two amounts together are the farmers’ total water expenses. We can see that the total water expenses per livestock unit are likely to be lower for the farmers who agreed on a rule compared to the ones not having agreed (means of 952 N$/LSU and 2397 N$/LSU respectively; P-value for two-tailed t-test is 0.08). There are no significant differences between the two payment systems. We further see that in situations with more homogeneous livestock possessions players tended to make higher contributions to the group fund (Pearson r=–0. 580, p=0.000, n=45) and had lower overall water expenses per livestock unit (individual payments plus breakdown fees) (Pearson r=–0.4 36, p=0.003, n=45). We cannot observe any impact of the rule formation on the total game income or changes in the value of the herd. The design of the underlying system model gives the stocking decisions a much stronger weight on these outcome variables than the water payments. This is actually also true for the state of the pasture. We observe, however, that the players agreeing to a rule degraded their pasture much more than the ones not agreeing (P-value for two-tailed t-test is 0.03; no differences between payment rules). Nevertheless, it would be bold to assume causality in this regard. Correlation analysis indicates that farmers with larger livestock numbers more likely agreed to a payment rule. Independent from the water payments these farmers are more likely to put stronger pressure on the pastures. Looking at the individual control variables provides some interesting results. Female players made lower contributions than their male counterparts. Beneficiaries with more real-life human and financial capital as well as better farming productivity made relatively higher contributions in the game. Our Mixed-Effects regressions give some encouraging results indicating a high external validity of our game. Firstly, farmers who made bigger real life investments into water infrastructure also made higher contributions in the game. Secondly, players farming on units where the water infrastructure is in fact better maintained also contributed higher amounts in the role-play (Table 2). We asked our respondents how many pumps they have on their farm and how many pumps are indeed working with the result that the larger the share of working pumps the higher the payments. We observe in our game relatively high levels of cooperation and no consequent free riding. These results are likely to be effected by the accessibility of social information on individual payment levels. Our main motivation to make payments transparent was to increase the external validity. There is a low degree of privacy in the researched communities. According to Carpenter and Seki (2011) and Henrich et al. (2010) participant behaviour in experimental settings is based on their real-life experiences. The participants in our role-plays share in real life the same water infrastructure and the joint management of this infrastructure is a typical challenge for them. Furthermore, they can easily observe each other’s actions. Revealing the individual payments very likely makes players adjust their payments to what they believe is approved by fellow players. Not to free-ride might be motivated by avoiding shame. Our design does, however, not allow us to draw conclusions about the effect of the anticipated approval or disapproval on the players’ decisions. The rule of payment per head of livestock has only been consciously agreed upon by one group in our role-play, while five groups adopted the rule of equal payment per person. This tendency can possibly be explained by the transaction costs of monitoring livestock numbers which is necessary to determine the individual payments. In each round of the game the payment has to be adopted to reflect the changing livestock numbers, while the amount is fixed under the rule of equal payment per person. In theory, a system of equal payment per person achieves a relatively high congruence of provision and appropriation if the variance of livestock endowment in a group is low. Since the payments under both rules match in groups with a relatively equal distribution of endowments, these groups are more likely to cooperate. We can clearly observe that groups with a lower variance in livestock endowment are more likely to reach a payment agreement. However, they generally choose the rule of equal payment per person. It is not seen that groups with a greater variance of livestock endowment are more likely to adopt the rule of payment per head of livestock. Does this empirical result allow us to reject Proposition 4? We do observe implicit norms of congruence of provision and appropriation. Independent of whether groups came to an agreement on a payment system, players owning more livestock tend to make higher contributions. Furthermore, players confronted with situations of unequal livestock distribution were more likely to informally adjust their payments to reflect their number of livestock. This result suggests the possibility that our players avoided the formalisation of a rule achieving high congruence of provision and appropriation due to the higher transaction costs associated with it. Despite this fact, a share of the players demonstrated a fairness norm suggesting an autonomous and informal adaptation of provision efforts to appropriation level. Nevertheless, more research is needed in order to reach a convincing conclusion on Proposition 4. Our role-plays simulated a real life cooperation situation using a social-ecological model. The virtual environment was sufficiently similar to reality, but simple enough to be played (Gurung et al. 2006). In this way, we increase the potential for players to learn about the real-life behaviour of one another through the role-play. Using the terminology of Roe and Just (2009), we increase our ecological validity to the extent that the context of the research is similar to the context of interest. As a consequence, the possibility to replicate our results is limited. Nevertheless, playing with subjects who actually experience similar decisions as represented in the game allows us to make specific statements about their behaviour. We see it as an indicator for the success of our approach that individuals who made higher payments in the role-plays also manage to keep their real-life infrastructure in better condition. The simulation-model based role-plays produced not only knowledge but provided support to stakeholders in their decision making (Barreteau et al. 2001; Barreteau 2003; Gurung et al. 2006; Guyot and Honiden 2006; Becu et al. 2008). There was uniform response from the participants that they perceived the exercise as training rather than research activity. Gurung et al. (2006) emphasizes that one key objective of participatory modelling is to facilitate dialogue, shared learning, and collective decision making through interdisciplinary research; thus, strengthening the adaptive management capacity of local communities. Modelling in combination with role-plays is a way to experiment with rules and strategies and, in this way, explore probable ecological and economic consequences. It limits the costs of trial and error methods and shifts the approach from costly learning by doing towards learning by simulating (Barreteau et al. 2001). Our approach simultaneously deepens the understanding of cooperation processes and encourages discussion and institution building. In this sense, we supported Namibian land reform beneficiaries in a current and relevant challenge. It would have been difficult to measure any impact of our research given the small sample and methodological limitations. Nevertheless, we believe that our work demonstrates the potential of the research approach to contribute to achieving more productive, sustainable and resilient agricultural development. Future research should also focus on measuring such impact. The authors acknowledge that this study can only provide a snap shot picture. The role-play approach was intended to assess decisions that are taken over a long period of time within a few hours which is a clear advantage of this method. Of course this could also be a limitation as real life decision processes are much more complex than the ones which can be modelled in a role-play. Which policy implications can be drawn from our research? First of all, the research confirms the ongoing challenge of institution building faced by land reform beneficiaries. This is not a short-term issue anymore as some of the beneficiaries were resettled more than 20 years ago. Government and non-government extension services currently have a strong focus on developing farmers’ technical skills. Institutional capacity development in pre- and post-resettlement support needs more attention. This is a challenging process as there are no standard rules which fit all cases. Currently the Ministry of Agriculture, Water and Forestry mainly promotes the payment system per head of livestock. Our research indicates, however, that this rule is not necessarily the most preferred one. The process of rule negotiation has to be open to the preferences of different groups and their specific circumstances. Given the difficulties to externally enforce by-laws of FURS groups it is important that the groups strongly support a rule on a moral and social basis (see also Falk et al. 2012). But maybe the loose social relations are also a chance. Schnegg and Linke (2015) show that social networks can actually hamper the effectiveness of water management institutions. The specific context also raises the question whether institutions indeed have to be always formalised. Why should groups formalize what they are doing anyway? There is always the risk that formalisation crowds out clearly observable informal norms (see e.g. Cardenas et al. 2000; Vollan 2008; Bowles and Polanía-Reyes 2012). At the same time, why are farmers not prepared to formalize what they are doing anyway? In our games the people agreeing to a rule had overall lower expenses for water per livestock unit compared to the ones who followed informal norms only. It seems, however, that in particular smaller farmers fell less comfortable with committing to formal rules. Are they more worried that the rules turn against them? Is it more difficult for them to assert their interests in negotiations on the formalisation of rules? Our study cannot answer these questions but it can create awareness for the fact that in the process of institutional capacity development special attention should be paid to owners of smaller herds. Another important policy implication of our research is the need to pay special attention to less homogenous groups in terms of livestock endowments. The Ministry of Lands and Resettlement could consider taking the heterogeneity of livestock ownership into account when allocating land units. 1For all players in all sessions we used the same randomly calculated sequence of precipitation. 2The total farm expenses contain an amount which is based on the size of the land and an amount which is based on the number of livestock. In order to simplify the role play the general expenses per ha and per head of livestock have been fixed in the game on the basis of expert knowledge and previous studies. The general farm expenses per head of livestock are relevant for the water management as we subsumed under this amount also the costs for buying diesel to run the pumps. This was possible as there is widespread agreement that the even more consumption dependent running costs of the pumps are paid per head of livestock. 3There are several explanations why communication supports cooperation. Balliet (2010) mentions, in particular, receiving signals about other’s willingness to cooperate, group identity and the development of shared norms. 4Two observations could not be used in part of the analyses because we failed to collect the survey data. 5Where there is a correlation between the player’s payment and the payments of the rest of the group in a particular experiment period (Pearson correlation calculated and considered to be correlated if p<0.05). 6A communal land reform programme is also under way, which formalizes and partly privatizes common property rights, in communal areas. This process is, however, not subject of this paper. 72008 livestock prices have been derived from the internet database of AGRA Namibia co-operative Ltd. at http://www.agra.com.na. This study was part of the BIOTA project (01LC0024I) which was funded by the German Federal Ministry for Education and Research. We thank Michael Kirk, the coordinator of the BIOTA governance subproject, for his dedicated support. Special acknowledgement goes to all surveyed communities for their time, assistance and hospitality. The study was conducted in cooperation with Bertus Kruger coordinating the Emerging Commercial Farmer Support Programme and Richard Kamukuenjandje lecturing at the Polytechnic of Namibia. We thank all student assistants who contributed to the study, in particular Reinhold Kambuli, Pombili Sheehama, Linnéa Koop, Nora Heil, Lisa Lebershausen, Daniela Neu, Anne Frank, Muhammad Aneeque Javaid, and Michael Perdue. Balliet, D. P (2010). Communication and Cooperation in Social Dilemmas: A Meta-Analytic Review. Journal of Conflict Resolution 54(1): 39–57. Bardhan, P (1993). Analytics of the Institutions of Informal Cooperation in Rural Development. World Development 21(4): 633–639. Barreteau, O (2003). Our Companion Modelling Approach. Journal of Artificial Societies and Social Simulations 6(1) http://jasss.soc.surrey.ac.uk/6/2/1.html. Barreteau, O, Bousquet, F and Attonaty, J. M (2001). Role-Playing Games for Opening the Black Box of Multi-Agent Systems: Method and Lessons of its Application to Senegal River Valley Irrigated Systems. Journal of Artificial Societies and Social Simulations 4(2): 5. Becu, N, Neef, A, Schreinemachers, P and Sangkapitux, C (2008). Participatory Computer Simulations to Support Collective Decision-Making: Potential and Limits of Stakeholder Involvement. Land Use Policy 25: 498–509. Bock, B and Kirk, M (2006). Rural Water Pricing Systems in Namibia: Effects on Water use and Livelihoods. Quarterly Journal of International Agriculture 45(4): 339–360. Bousquet, F, Barreteau, O, d’Aquino, P, Etienne, M, Boissau, S, Aubert, S, Le Page, C, Babin, D and Castella, J. C (2002). Janssen, Marco A (ed. ), Multi-Agent Systems and Role Games: Collective Learning Processes for Ecosystem Management. Complexity and Ecosystem Management: The Theory and Practice of Multi-agent Systems. Cheltenham: Edward Elgar, pp. 248–285. Bowles, S and Polania-Reyes, S (2012). Economic Incentives and Social Preferences: Substitutes or Complements?. Journal of Economic Literature, : 368–425. Cardenas, J. C, Stranlund, J and Willis, C (2000). Local Environmental Control and Institutional Crowding Out. World Development 28(10): 1719–1733. Carpenter, J. P and Seki, E (2011). Do Social Preferences Increase Productivity? Field Experimental Evidence from Fishermen in Toyama Bay. Economic Inquiry 49(2): 612–630. Falk, T, Bock, B and Kirk, M (2009). Polycentrism and Poverty: Experiences of Rural Water Supply Reform in Namibia. Water Alternatives 2(1): 115–137. Falk, T, Kruger, B, Lohmann, D, Kamukuenjandje, R, Zimmermann, I, Kirk, M, Hindjou, J, Kambuli, R, Sheehama, P, Koop, L, Heil, N, Lebershausen, L, Neu, D and Frank, A (2010). Jürgens, N et al. Economic and Ecological Indicators of Land Reform Projects in Eastern Namibia. Biodiversity in Southern Africa. Volume 2: Patterns and Processes at Regional Scale. Klaus Hess Publishers, Göttingen & Windhoek, pp. 200–206. Falk, T, Vollan, B and Kirk, M (2012). Analysis of Material, Social, and Moral Governance in Natural Resource Management in Southern Namibia. International Journal of the Commons 6(2): 271–301. Fehr, E and Schmidt, K. M (1999). A Theory of Fairness, Competition, and Cooperation. The Quarterly Journal of Economics 114(3): 817–868. Fischbacher, U and Gächter, S (2010). Social Preferences, Beliefs, and the Dynamics of Free Riding in Public Goods Experiments. American Economic Review 100(1): 541–556. Foran, T, Butler, J. R, Williams, L. J, Wanjura, W. J, Hall, A, Carter, L and Carberry, P. S (2014). Taking Complexity in Food Systems Seriously: An Interdisciplinary Analysis. World Development 61: 85–101. Gurung, T. R, Bousquet, F and Trébuil, G (2006). Companion Modelling, Conflict Resolution, and Institution Building: Sharing Irrigation Water in the Lingmetuychu Watershed, Bhutan. Ecology and Society 11(2): 36. Guyot, P and Honiden, S (2006). Agent-Based Participatory Simulations: Merging Multi-Agent Systems and Role-Playing Games. Journal of Artificial Societies and Social Simulations 9(4) http://jasss.soc.surrey.ac.uk/9/4/8.html. Hardin, G (1994). The Tragedy of the Unmanaged Commons. Trends in Ecology & Evolution 9: 199–199. Henrich, J, Heine, S. J and Norenzayan, A (2010). The Weirdest People in the World?. Behavioral and Brain Science 33(2–3): 61–83. Hinkel, J, Cox, M. E, Schlüter, M, Binder, C. R and Falk, T (2015). A Diagnostic Procedure for Applying the Social-Ecological Systems Framework in Diverse Cases. Ecology and Society 20(1): 32. Janssen, M. A (2010). Introducing Ecological Dynamics into Common-Pool Resource Experiments. Ecology and Society 15(2): 7. Kaukungua, S, Eiseb, G. E. E, Horsthemke, O, Tjimune, V. M, Kasheeta, S and Kashululu, R. M (2004). Background Research Work and Findings of the PTT Studies. The Permanent Technical Team (PTT) on Land Reform, Ministry of Lands, Resettlement and Rehabilitation, Windhoek, Namibia. LAC/Legal Assistance Centre. Our Land we Farm – An analysis of the Namibian Commercial Agricultural Land Reform Process. Land, Environment and Development (LEAD) Project, Legal Assistance Centre, Windhoek, Namibia. [online] URL: http://www.lac.org.na/projects/lead/Pdf/landwefarm.pdf. Lohmann, D, Tietjen, B, Blaum, N, Joubert, D. F and Jeltsch, F (2012). Shifting Thresholds and Changing Degradation Patterns: Climate Change Effects on the Simulated Long-Term Response of a Semi-Arid Savanna to Grazing. Journal of Applied Ecology 49: 814–823. Lohmann, D, Falk, T, Geissler, K, Blaum, N and Jeltsch, F (2014). Determinants of Semi-Arid Rangeland Management in a Land Reform Setting in Namibia. Journal of Arid Environments 100: 23–30. McGinnis, M. D and Ostrom, E (2014). Social-Ecological System Framework: Initial Changes and Continuing Challenges. Ecology and Society 19(2): 30. Mendelsohn, J (2006). Farming Systems in Namibia. Windhoek: Research and Information Service. Mendelsohn, J, Jaris, A, Roberts, C and Robertson, T (2002). Atlas of Namibia. Cape Town, South Africa: David Philips Publishers. Nowak, M. A (2006). Five Rules for the Evolution of Cooperation. Science 314: 1560–1563. Ostrom, E (1998). A Behavioral Approach to the Rational Choice Theory of Collective Action. The American Political Science Review 92(1): 1–22. Ostrom, E (2009). A General Framework for Analyzing Sustainability of Social-Ecological Systems. Science 325: 419–422. Ostrom, E (2010). Beyond Markets and States: Polycentric Governance of Complex Economic Systems. American Economic Review 100: 641–672. Popp, A, Vogel, M, Blaum, N and Jeltsch, F (2009). Scaling up Ecohydrological Processes: Role of Surface Water Flow in Water-Limited Landscapes. Journal of Geophysical Research-Biogeosciences 114: 1–10. Roe, B. E and Just, D. R (2009). Internal and External Validity in Economics Research: Tradeoffs between Experiments, Field Experiments, Natural Experiments and Field Data. American Journal of Agricultural Economics 91(5): 1266–1271. RoN/Republic of Namibia. National Resettlement Policy. Windhoek, Namibia: Ministry of Lands, Resettlement and Rehabilitation. RoN/Republic of Namibia. Notification No. 219 of farming units offered for allotment according to the Agricultural (Commercial) Land Reform Act, 1995. Windhoek, Namibia: Government Gazette. RoN/Republic of Namibia. A Review of Poverty and Inequality in Namibia. Windhoek, Namibia: National Planning Commission. RoN/Republic of Namibia. Namibia 2011 Population and Housing Census – Preliminary Results. Windhoek, Namibia: National Planning Commission. Schnegg, M and Linke, T (2015). Living Institutions: Sharing and Sanctioning Water among Pastoralists in Namibia. World Development 68: 205–214. Stehn, H (2008a). Large Stock Management. Windhoek, Namibia: Joint Presidency Committee (NAU and the NNFU). Stehn, H (2008b). Rangeland Management. Windhoek, Namibia: Joint Presidency Committee (NAU and the NNFU). Sterman, J. D (2001). System Dynamics Modeling. California Management Review 43(4): 8–25. Sterman, J. D (2006). Learning from Evidence in a Complex World. American Journal of Public Health 96: 505–514. Tainton, N. M (1999). Veld Management in South Africa. Pietermaritzburg: University of Natal Press. Tietjen, B, Zehe, E and Jeltsch, F (2009). Simulating Plant Water Availability in Dry Lands Under Climate Change: A Generic Model of Two Soil Layers. Water Resources Research 45(1): 1–14. Tietjen, B, Jeltsch, F, Zehe, E, Classen, N, Groengroeft, A, Schiffers, K and Oldeland, J (2010). Effects of Climate Change on the Coupled Dynamics of Water and Vegetation in Drylands. Ecohydrology 3: 226–237. UNDP/United Nations Development Programme. http://hdrstats.undp.org/en/indicators/161.html (accessed 17 November 2010). Vollan, B (2008). Socio-Ecological Explanations for Crowding-Out Effects from Economic Field Experiments in southern Africa. Ecological Economics 67: 560–573. Werner, W (1993). A Brief History of Land Dispossession in Namibia. Journal of Southern African Studies 19(1): 135–146. Werner, W and Odendaal, W (2010). . Livelihoods After Land Reform – Namibia Country Report. Windhoek, Namibia: John Meinert Printing. Westoby, M, Walker, B. H and Noy-Meir, I (1989). Opportunistic management for rangelands not at equibilirium. Journal of Range Management 42: 266–274. Cooperation patterns of land reform beneficiaries in water management are the outcome of complex features of social-ecological systems (SES). We structure our explorative assessment according to the latest SES framework version of McGinnis and Ostrom (2014), into the main sub-systems: (i) Social, Economic, and Political Setting (S), (ii) the Resource System (RS) and Resource Units (RU), (ii) the Governance System (GS), (iii) and the Actors (A). Throughout this appendix we refer to the codes of the second tier SES variables according to the latest framework version. A more structured summary of the SES is given in Table A1.2. We do not present a separate section to processes and activities as interactions (I) between the above mentioned sub-systems. Instead, we will refer to interactions when talking about the resource system, the governance system and the actors. It is important to keep in mind, however, that the main interest of our research is to understand how FURS beneficiaries invest in the collective good water supply (I5) which is the outcome of complex interactions within the SES. Our study focuses on commercial land reform in Namibia6, where farmland is redistributed to groups previously subject to discrimination. The reform has to be seen in a historical context. Prior to colonial rule, pastoralist communities used the land in central Namibia, our research area. As a consequence of spatially and temporally highly variable biomass availability, these groups were dispersed widely over the territory in order to manage pastures efficiently. In the late 19th century, colonialists acquired practically the whole area used by these communities (Werner 1993). Linked to this development were the transformation of communal property regimes into private ones and the introduction of formal land titles. After South Africa received the mandate over Namibia in 1919, it established relatively small, communally managed reserves for black Namibians (Werner 1993). By the time of independence in 1990, approximately 4200 – predominantly white – farming households held 52% of the agricultural land under freehold titles. At the same time, 48% of Namibia’s farm land supported 70% of the population (Kaukungua et al. 2004). The colonial expropriation of black Namibians from land was a key factor for the design of the overall economic system. It provided white settlers with land, strongly restricted black Namibians’ access to the resources they so heavily relied on, and in this way forced them into exploitative wage labor relations in the mining and industrial sectors (Werner 1993). The Namibian government intends to achieve a mixture of political, social and economic goals with land reform. The key objective is to increase the income of citizens who were previously discriminated against by apartheid and other colonial policies. Furthermore, land reform is expected to contribute to political stability, poverty alleviation, the stimulation of agricultural and rural development, and growth (Kaukungua et al. 2004; Werner 2004; LAC 2005; Werner and Kruger 2007; RoN 2010; Werner and Odendaal 2010). The Namibian resettlement policy stipulates that the reform is to redress past imbalances in the distribution of economic resources, particularly land; create employment through full-time farming; alleviate human and livestock pressure in the communal areas; and offer previously disadvantaged social groups an opportunity to reintegrate into mainstream society and the economy (RoN 2001, 2010). In this context it should be noted that the reform’s focus shifted in the late 1990s from poverty alleviation towards taking also agricultural productivity into account. The reliance on willing-seller–willing-buyer policies is strongly supported by the international community. It is seen as one factor contributing to peaceful land redistribution. Others criticized that willing-seller–willing-buyer policies hinder a consequent pro-poor asset distribution. There is also opposition to elite capture, which pushes poverty groups out of the reform process. Figure A1.1 summarizes the reform process and illustrates the shift towards economic objectives. Time-line overview of the Namibian land reform process. Our research was conducted in the Omaheke region in east central Namibia (RS9). The vegetation is dominated by an Acacia-Terminalia tree-and-shrub savannah of the Central Kalahari (Mendelsohn et al. 2002). FURS land reform beneficiaries, in our sample, farm with livestock, mainly cattle, and operate in a commercial farming setting (RS1). The Omaheke region is considered to be a high-potential livestock farming area in Namibia with approximately 350 mm rainfall per year on average. Precipitation is spatially and temporally highly variable (Olbrich 2012) (RS5, RS7). The Ministry of Agriculture, Water and Forestry recommends a stocking rate between 12 and 18 ha/LSU (Mendelsohn 2006) (RS5). The farm unit clusters are clearly marked and fenced. FURS farmers are allotted individually fenced shares of the cluster (RS2). The clear boundaries ensure that groups of FURS farmers, sharing the same water points, effectively exclude outsiders from accessing their water. It is difficult, however, to exclude farmers within the cluster from water access. This creates incentives to free ride with regard to contributions to water-infrastructure maintenance (RS3, I4, I5). In our sample, the clusters consist of six farm units at maximum (RS3). The size of the individual farm units ranges between 50 ha and 2000 ha and the size of studied farm clusters varies between approximately 750 ha and 4.600 ha which is far below the average of commercial farm sizes in Omaheke (Olbrich 2012). Concerns have repeatedly been expressed that beneficiaries are allotted land units that are too small and, thus, not economically viable (Werner and Odendaal 2010). In the context of water infrastructure maintenance, more significant economies of scale can be realized on larger farm clusters. This is relevant, as Namibia is one of the driest countries in the world and water access is an essential precondition for any land use (RU4). The water is pumped almost exclusively from aquifers. Some of them are recharged by rain, but Namibia also holds significant fossil groundwater reservoirs (RU2). In Omaheke, mainly diesel and wind pumps are used to access ground water (RS4). Farm clusters in our sample, jointly use one to four pumps (RU5). One pump serves between 375 and 4300 ha (RU4, RU7). Livestock is the main consumer of water at the researched FURS farms with an estimated water demand for a single farmer’s herd ranging between 125 and 3500 litres per day (I1). The water access points, in terms of water infrastructure, are totally immobile and therefore land reform beneficiaries do not face typical challenges associated with high resource mobility (RU1). In the absence of permanent open water sources, a breakdown of water infrastructure leads to livestock losses and significant costs. If water infrastructure breaks down, farmers are forced to ask for water access at neighbouring farms. Usually fees need to be paid for such water access, and longer routes to water points contribute significant stress to the animals (RU4). Many water points have a small reservoir with a capacity sufficient to store the water demand for only a few days (RS8). Namibia is a constitutional democracy with a dominant party (the SWAPO Party of Namibia). It has been politically stable since its independence from South Africa in 1990 (S3). Land Reform is an important policy for Namibia as it not only mediates unfair land distribution, but also maintains political stability in the country. For more than 18 years, land has been redistributed to previously disadvantaged groups of the Namibian society using a broad range of instruments, such as group resettlement, subsidized loans, redistribution of government land and, in a few cases, expropriation. In this paper, we focus on the Farm Unit Resettlement Scheme (FURS) which is based on the willing-seller willing-buyer principle. The Namibian state uses preferential acquisition right to purchase suitable agricultural land whenever any owner of such land intends to dispose of it (RoN 1995). The Ministry of Lands and Resettlement (GS1) divides the farms into smaller portions and any Namibian citizen who has been socially, economically or educationally disadvantaged by past discriminatory laws can apply for an allotment of land acquired for resettlement (e.g. RoN 2002). Successful applicants are supposed to receive a 99-year lease agreement with the government. We observe, however, that by 2008 39% of the FURS farmers in our sample did not hold a leasing contract. These beneficiaries, therefore, have no written proof of their rights to the allotted land; therefore, causing negative consequences on their tenure security (Falk et al. 2010; Werner and Odendaal 2010) (GS4). Tenure security is strongly linked to water supply. The government can only sign leasehold agreements once a full repair of farm infrastructure has been completed. Unclear responsibilities between the Ministry of Lands and Resettlement, the Ministry of Agriculture, Water and Forestry, the FURS beneficiaries and capacity constraints on all sides delay this process (GS1, I5). The collective action situation on FURS farm clusters is strongly shaped by the process of land redistribution. The splitting of larger farms, that were previously centrally managed, into smaller farm units means that beneficiaries do not have exclusive access to water infrastructure. They are forced to cooperate with their neighbouring farmers on the farm cluster (GS3, I7). The sharing of water infrastructure is even emphasized in the lease agreement. In addition, FURS land reform beneficiaries enter the cooperation arena solely on the basis of bureaucratic land allocation decisions made by the Ministry of Lands. They have no say as to whom they cooperate with, do not know their future cooperation partners (GS3), and, therefore, cannot rely on a history of social interaction (A3). As a consequence, cooperation agreements can be achieved only on the basis of active self-organised deliberation processes on water provision and appropriation rules (I3, I7). We are not aware of any significant process facilitation by government or NGO extension services (GS1, GS2). This situation strongly influences the institutional setting within the clusters. Constitutional and collective choice rules are not existent (GS7, GS8) at the time of land redistribution. The lease agreement prescribes only that the land reform beneficiaries of a farm cluster are obliged to share water infrastructure. The initial absence of constitutional and collective choice rules does not support the efficient creation of operational rules. The lease agreement makes some operational provisions even though they are confusing. According to the lease agreement, the Ministry of Lands is still responsible for the maintenance of the infrastructure. At the same time, land reform beneficiaries are obliged to keep the water infrastructure in the same state as it was when the farm was handed over. Taking into account that lease agreements are signed for a 99 year period, this raises questions about who is responsible for the general maintenance (GS6, I5). In reality, the government is extremely slow in responding to requests to maintain water infrastructure. If farmers do not want to risk losing animals in case of infrastructure breakdowns, they have to repair it themselves (I5) on the basis of their own rules (GS6). In our research region, there are two typical operational rules with regard to contributions to infrastructure maintenance. Either farmers pay an equal fixed amount or they calculate a fee per head of livestock. The second rule supports congruence of provision and appropriation which is considered to be more fair and sustainable and is also promoted by the Ministry of Agriculture (GS6, A6). Land reform beneficiaries need to obtain the ministry’s permission for any infrastructure improvements. The government is reluctant to give this permission because it would have to compensate the farmer for any improvements once the agreement expires or is terminated. Contributions to the maintenance of water infrastructure are easy to monitor within the small groups. A challenge can be, however, to assess the herd size of each farmer which is necessary if payments are linked to livestock numbers. The farm units are usually large and densely vegetated, such that it is not easy to count the herd. The implementation of a rule ensuring higher congruence of provision and appropriation, therefore, causes additional transaction costs (GS8, I9). Sanctioning is very difficult within the groups. The lease agreements do not allow restrictions of water access which could be a mechanism to sanction free riders. Since newly emerging rules are not formalised they cannot be enforced using state authority. Neither civil society organisations nor traditional authorities play an important role in the governance of FURS farms. The latter is partly attributed to the fact that the groups are multi-ethnic. As such, the groups can only use social pressure as a sanctioning mechanism (GS8). The Omaheke Region is known as Namibia’s “Cattle Country” producing high-quality meat for the national, regional and international market. With regard to various aspects of agriculture, Namibian farmers strongly depend on South African markets. For instance, nearly 50% of Namibian cattle farmers’ livestock-offtake are weaners sold alive to feedlots in South Africa. This explains why commercial livestock farmers are afraid of unfavourable developments in the input, output and labour markets (Olbrich 2012). The Namibian government is attempting to encourage domestic value addition. Strong new market incentives have evolved from Angola, where significant amounts of financial capital circulate and whose farmers are restocking their herds following the end of the civil war in 2002 (S5). In 2008, Namibia had a Human Development Index of 0.613 which is well above the average for sub-Saharan Africa (UNDP 2010). Namibians’ average gross domestic product (GDP) per capita was US$6600 in 2009. The country has one of the most unequal income distributions in the world (UNDP 2010). Approximately 30% of Omaheke’s population is poor, and 18% are classified as severely poor (RoN 2008) (S1). In 2011, the Namibian population was 2,104,900 persons. Between 2001 and 2011 it has been growing by 15% (RoN 2012). In 2011, 70,800 people lived in the Omaheke Region. The population density for the same year was 0.8 people per km² (RoN 2012) (S2). Our sample consists of individual farmers using one farm unit exclusively. Table A1.1 summarizes the basic descriptive statistics of our sample. By 2008, the beneficiaries in our sample had been granted access to their farming units between 1 and 23 years prior (A3). The majority of respondents (82%) use the farm units for more than 4 years. This means they have already had considerable time to develop infrastructure maintenance rules. The government’s selection criteria for FURS beneficiaries have repeatedly changed, but the program generally focuses on the poor. Sixty per cent of the heads of household within the sample are permanently present on the farm and consider themselves to be full-time farmers. Nevertheless, 80% of the respondents claim to have non-farm income. Many land reform beneficiaries struggle to generate income from their farms. In 2008, 45% of the sample managed to make a profit before investment costs, and only one third had a positive marginal farm income after investment costs were taken into account (see also Figure A1.2; there are two missing values from our sample). Such losses are in sharp contrast to Olbrich’s (2012) numbers for commercial cattle farmers in Namibia. In his sample, 84% had an income of more than 40% above the national per capita average per year. Forty-four per cent of the heads of household did not finish secondary school, 47% finished secondary school as the highest degree, and 9% hold a technical or university degree. Seventy-two per cent of our sample had previous farming experience, but only a minority of them in a commercial setting. Only 23% of the respondents received some kind of farming-training (A2, A7). These figures indicate that land reform beneficiaries are significantly less educated than established commercial farmers (Olbrich 2012). Many farmers are organized into unions (GS2, A6, I8), with the Namibia Agricultural Union (NAU) mainly representing the established commercial farmers, and the Namibia Emerging Commercial Farmers’ Forum (NECFF) addressing the needs of land reform beneficiaries. The unions engage in knowledge exchange (I2) and capacity development, lobbying (I6) and research, and supporting various marketing activities. We did not become aware of any leadership structures (A5). The size of the groups in our sample sharing water infrastructure ranged from two to six. In 43% of the groups, more than one ethnic group was represented with a maximum of 3 ethnicities being represented. The main technologies used to supply the farms with water are wind and diesel pumps. Only one electric and one solar pump were recorded in our sample. An important difference between diesel and wind pumps are the higher running costs of diesel engines. Fuel and oil needs to be continuously provided in order to ensure water supply. Diesel pumps are more costly in terms of maintenance, but they are also more powerful. We have no data available regarding the costs per pumped litre of water. Summary of the second tier Social-Ecological-Technical System variables of the Omaheke Region, Namibia in the context of land reform beneficiaries’ joint provision of water. RS1 – Sector FURS land reform beneficiaries in the Omaheke Region farm livestock, mainly cattle. They operate in a commercial farming setting. All farmers in our sample were livestock farmers. There is no variance in our sample. RS2 – Clarity of system boundaries The Omaheke Region has clear administrative boundaries. We define our focal SES as a small scale SES of a cluster of land reform farms which share the same water infrastructure. FURS farmers are allotted individual clearly marked and fenced units of land. Therefore the boarders of our focal SES are very clear as are the boarders of the sub-units within our focal SES. In our sample the clusters consist of, at maximum, six farm units. Interpreting system boundaries as the clarity of system exclusion we can say that FURS farmers can easily exclude outsiders from accessing their water infrastructure. It is difficult, however, to exclude farmers from water access who are part of the farm cluster sharing the water infrastructure. This situation creates incentives to free ride on fellow farmers with regard to ones contributions to water infrastructure maintenance. Farm boundaries are clear for all farms in our sample. The impact of boarder clarity on farmer’s cooperation is, therefore, not in the focus of our study. The social dilemmas associated with the difficulty of excluding fellow farmers from water access are in the centre of our study. We design a role play in which farmers who are sharing water infrastructure in real life are supposed to maintain the virtual joint infrastructure. RS3 – Size of resource system The size of the Omaheke Region is 84.731 km². The mean commercial farm size for central Namibia, according to Olbrich (2012), is 7178 ha for privately owned land and 1151 ha for long-term leased land. Our studied farm clusters vary between approximately 750 ha and 4.600 ha. The farm units within the clusters vary between 50 ha and 2000 ha. Concerns have repeatedly been expressed that beneficiaries are allotted land units that are too small and, thus, economically not viable (Werner and Odendaal 2010). In the context of water infrastructure maintenance more significant economies of scale can be realized on larger farm clusters. In our analysis, we control for the size of each farm unit. RS4 –Human-constructed facilities Namibia is one of the driest countries in the world and water access is an essential precondition for any land use. In Omaheke, mainly diesel and wind pumps are used to access ground water. In the absence of permanent open water sources a breakdown of this infrastructure leads to livestock losses and significant costs. On FURS farms, the infrastructure – especially water points – are supposed to be fully maintained by the government before land redistribution. In 2008, beneficiaries in our sample invested between 0.20 and 46.27 €/ha in vehicles, machinery, fences, water points, houses, energy supply infrastructure, and tools. Our study focuses on water infrastructure. We try to explain the individual contributions to the water infrastructure maintenance in a group of water users. RS5 – Productivity of system, and RS6 – Equilibrium properties The Omaheke region is considered to be a high-potential livestock farming area in Namibia, with approximately 350 mm rainfall on average per year. Precipitation is spatially and temporally highly variable (Olbrich 2012). Most of the land reform farms are in a comparatively poor ecological state. Restoration of and transition of rangeland to an improved state is much more difficult than a further deterioration of the land (Falk et al. 2010). A well maintained and developed water infrastructure can prevent localized pasture degradation as livestock can be distributed more widely on the farm. The fact that water infrastructure influences pasture degradation underlines, amongst other factors, the relevance of our research. It is, however, not in the focus of this study to better understand the details of this relationship. RS7 – Predictability of system dynamics The high spatial and temporal variability of rainfall leads to unpredictable biomass production (see also Olbrich 2012). Drought years can lead to liquidity shortages and the temporal unavailability of cash needed to maintain water infrastructure. Another important source of unpredictability is the fact that farmers cannot predict when water infrastructure breaks down. They have to take precaution in order to avoid even temporal water shortages. We consider unpredictable resource availability to be an important aspect of the Omaheke farming system. Therefore, it is strongly reflected in our role-plays. The role-plays are based on a social-ecological-simulation model. The model randomly calculates the rainfall and water infrastructure breakdowns. RS8 – Storage characteristics Most water points have a reservoir which can store water for a limited period of time. Larger reservoirs can potentially mitigate the negative effects of pump breakdown as the farmers have more time to repair the pump without facing water shortage. Standing palatable biomass can be used until it has been consumed or burned. We do not distinguish in our study between pump and reservoir infrastructure as storage facilities are generally small. RS9 – Location The Omaheke region is situated in east-central Namibia. Farm units of a farm cluster are located around a water point giving all farmers direct access to the water source. We cannot see the potential impacts of farm location on the cooperation of land reform beneficiaries in the maintenance of water infrastructure. RU1 – Resource unit mobility For the identification of the relevant Resource Unit, we ask ourselves which collective goods are involved in the generation of benefits from the farms (see Hinkel et al. 2015). The critical collective good is, in our case, the provided water. Water supply is, however, directly linked to the provision of water infrastructure. It is therefore instrumental for our study to consider the water infrastructure being the relevant Resource Unit. This demonstrates that our case requires a social-ecological-technical system (SETS) perspective. The water flow could be interpreted as high resource unit mobility. Nevertheless, the water access points, in terms of water infrastructure, are totally immobile and therefore land reform beneficiaries do not face typical challenges associated with high resource mobility. Throughout our sample there is low resource unit mobility. We therefore do not focus on this aspect in our study. RU2 – Growth or replacement rate The water is pumped from aquifers. Some of them are recharged by rain but Namibia also holds significant fossil groundwater reservoirs. Most of the provided water is used for livestock which is farmed extensively. Therefore, only moderate amounts of water are extracted. The hydrological system is still poorly understood. The water infrastructure does not regenerate without human support. Poor data availability limited the possibility of considering the hydrological replacement dynamics. We therefore could not take this aspect into account. RU3 – Interaction among resource units We are not aware of any interactions between water units or between water points. This aspect is not relevant in the context of our study. RU4 – Economic value The Omaheke hardly holds any surface water sources. Farming the land strongly depends on pumping ground water. As such, the value of the water is perceived to be very high by many livestock farmers. Water is perceived to be the more valuable the scarcer it is. One borehole on our sample farms had to serve between 375 and 4300 ha of farmland. It can be assumed that, for a particular area, the value of water and, consequently, water infrastructure is perceived to be higher the lower the borehole density. In our role-plays the borehole density and, therefore, the water scarcity did not vary. We did not want to add another aspect of complexity to the game. However, in our analysis we control for whether the real life borehole density has an effect on the individual farmers’ contributions to the water infrastructure maintenance. RU5 – Number of units We do not have data available on the amount of water available in aquifers nor the amount extracted from them. Farm clusters in our sample use jointly one to four pumps. Due to poor data availability, we could not include this aspect in our analysis. RU6 – Distinctive characteristics In the original sense, distinctive markings do not matter in our case as the resource units can be considered to be immobile. The water quality varies between different boreholes, in particular, with regard to the content of minerals. The salinity of water is, however, mainly relevant for the value of the water for human consumption. Distinctive characteristics of resource units are not relevant in the context of our study. RU7 – Spatial and temporal distribution As mentioned before, the density of boreholes strongly varies between our sample farms (between 375 and 4300 ha per borehole). There is no significant temporal variation in water availability since the water is pumped from aquifers. Neither temporal nor spatial distribution effects of water availability have been features in our role-play. However, during our data analysis we control for the borehole density. GS1 – Government organizations The most important government organizations with respect to the FURS instrument of the Namibian land reform are the Ministry of Lands and Resettlement and the Ministry of Agriculture, Water and Forestry. There are some unclear responsibilities between the two ministries. In general, the Ministry of Lands is responsible for preparing farms for redistribution. This includes a full repair of all infrastructures. At the same time the Ministry of Agriculture is responsible for rural water supply. As a result of this unclear situation, the repair of infrastructure is delayed. This not only deteriorates the water supply. Since the Ministry of Lands can only sign leasehold agreements with the beneficiaries, this situation also leads to insecure property rights for some beneficiaries (see GS4). Three is no variance within our sample regarding the role of different government organizations. As such, we cannot make statements about their influence on the beneficiaries’ cooperation. GS2 – Non-governmental organizations (NGOs) There is strong international donor support for Namibia’s land reform program. Furthermore, farmers are organized into unions with the Namibia Agricultural Union (NAU) mainly representing the established commercial farmers, and the Namibia Emerging Commercial Farmers’ Forum (NECFF) addresses the needs of land reform beneficiaries. The unions engage in knowledge exchange and capacity development, lobbying and research, and support various marketing activities. At the time of the study, farmers unions hosted the Emerging Farmers’ Support Programme (EFSP), which was financed by EU and German development aid. The EFSP focused strongly on various aspects of capacity development. Land reform beneficiaries have equal opportunities to gain from the support of NGOs and farmers unions in terms of lobbying and marketing. How far these support activities affect cooperative behaviour can, therefore, not be assessed within our sample. We include, however, the weeks of farming training as a proxy for capacity development activities of various organizations. GS3 – Network structure FURS land reform beneficiaries are forced, by the Ministry of Lands, into a situation where they must cooperate with people they did not know before. The government buys farms on the land market, splits them into smaller units and allocates them to applicants. As a result, the farm units do not have exclusive water infrastructure; thus the beneficiaries have to share the formerly centrally-managed infrastructure. The sharing of water infrastructure is even emphasized in the lease agreement. People from different parts of the country with different ethnic origins must find a way to jointly manage the infrastructure. In this way new important networks related to water supply are created. The focus of our research is to understand how local land reform beneficiaries cooperate in the provision of water. We assess the cooperation behaviour using a simulation-model based role-play. GS4 – Property rights systems FURS farms are owned by the state. Farmers are supposed to receive long-term leasehold titles which give beneficiaries – in the words of Schlager and Ostrom (1992) – individual rights of access, withdrawal, and exclusion. Generally, farmers also have the right to manage, but the leasing agreements include various land use restrictions. Alienation rights are exclusively kept by the state. In addition, national laws and policies place some restrictions on the rights to manage the land. In 2008, 39% of our sample held no leasehold agreement and, therefore, no written proof of their rights to the allotted land. The Ministry of Lands and Resettlement delayed signing contracts (Falk et al. 2010; Werner and Odendaal 2010). For a description of one reason please see GS1. Insecure property rights are likely to affect the willingness of land reform beneficiaries to invest in water infrastructure. There are no differences regarding the property rights of the players in our games. However, in our analysis we control for whether farmers who have signed a leasehold agreement are willing to make higher contributions to infrastructure maintenance in the game. GS5 – Operational-choice rules For the most part, FURS farmers can make their own decisions about operational rules. They are restricted only by national policies and laws, e.g. the Environmental Management Act, 2007 (No. 7 of 2007) and the Water Resources Management Act, 2004 (No. 24 of 2004). In addition to national policies and laws, their leasing agreements restrict their land management decisions to a large degree. The lease agreement specifies that the land reform beneficiaries of a farm cluster are supposed to share the water infrastructure. It further specifies that the Ministry of Lands is still responsible for the maintenance of the infrastructure. At the same time, land reform beneficiaries are obliged to keep the water infrastructure in the same state as it was when the farm was handed over. Taking into account that lease agreements are signed for a 99 year period, this raises questions about who is responsible for the general maintenance. In reality, the government is extremely slow in responding to requests to maintain water infrastructure. If farmers do not want to risk losing their herd in case of infrastructure breakdowns they have to repair it themselves. Operational rules within the group of a farm cluster are to be agreed upon by the farmers only. In our research region there are two typical operational rules with regard to contributions to infrastructure maintenance. Either farmers pay an equal fixed amount or they calculate a fee per head of livestock. We associate the first rule with a conditional cooperation pattern, while the second rule achieves congruence of provision and appropriation. The rule of congruence of provision and appropriation is considered to be more fair and sustainable and is also promoted by the Ministry of Agriculture. Land reform beneficiaries need to obtain the ministry’s permission for any infrastructure improvements. The government is reluctant to give this permission because it would have to compensate the farmer for any improvements once the agreement expires or is terminated. Our role-plays simulate the situation where groups need to make contributions to the water-infrastructure maintenance. We play with groups of players who also, in real-life, have to manage infrastructure together. An important feature of the game is that we also simulate ecological and herd dynamics. As in real life, this creates additional transaction costs for farmers who choose a rule of congruence of provision and appropriation. It is important to note that we do not consider our research as only a study of group cooperation in water infrastructure maintenance. The role-plays have a high degree of external validity and can therefore encourage the negotiation of new operational rules. This is more important as the groups do not have a history of cooperation and cannot rely on grown institutions. GS6 – Collective choice rules Little is known about collective choice rules of land reform beneficiaries sharing the same water infrastructure on a farm unit cluster. They have to agree on new collective choice rules without a history of cooperation. Neither the government nor farmer’s support programs pay much attention to this class of institutions. Studying collective choice rules was not in the focus of our research. We could partly observe negotiation processes during our games but did not specifically record them. Our approach encouraged also the establishment of new collective choice rules. GS7 – Constitutional-choice rules No authority prescribes collective choice rules regarding the cooperation in the maintenance of water infrastructure on FURS farms. Constitutional rules are absent. Constitutional rules have not been the focus of our study. GS8 – Monitoring and sanctioning Contributions to the maintenance of water infrastructure are easy to monitor within the small groups. However, it can be a challenge to assess the number of livestock of each farmer which is necessary to implement the rule of congruence of provision and appropriation. The farm units are usually large and densely vegetated such that it is not easy to count the herd. Sanctioning is very difficult within the groups. The lease agreements do not allow restrictions of water access which could be a mechanism to sanction free riders. Since the rules are not formalised they cannot be enforced using state authority. Traditional authorities do not play an important role on FURS farms which is partly attributed to the fact that the groups are multi-ethnic. As such, the only sanction mechanism the group can use is social pressure. In our role-play, farmers could easily find out the livestock numbers of the fellow farmers/players. This reduced the monitoring costs related to the rule of congruence of provision and appropriation. As in real life, our players could not make use of any other sanctioning mechanism but praise or blame. A1 – Number of relevant actors In our sample, two to six farmers jointly manage and use one water point. However, their farming units are under exclusive use. In our role-plays, the groups of farmers who play together also share water infrastructure in real-life. This means that the group size in our games also varied between two and six. In our analyses we control for the effects of group size. A2 – Socio-economic attributes The SES variable A2 summarize a wide range of actor characteristics. In our understanding of these attributes, we include all aspects of capital endowments that have not been covered elsewhere as well as socio-demographic attributes. Commercial cattle farmers in Namibia tend to earn above the national per capita income. Some 84% of Olbrich’s (2012) sample earned an income which was at least 40% above the national per capita average per year in 2004 terms (approximately € 3500). In contrast, only one third of the FURS farmers in our sample generated any marginal farm income (including investments) on their farm. Generally speaking, land reform beneficiaries are not wealthy citizens. At the time of the land redistribution, 43% of our sample had an income below € 300 per annum and only 7% earned above € 6000 a year. The age of households heads in our sample ranged from 19 to 82 (mean=55). Two-fifths of the sample were women. Namibia’s commercial farmers are, according to Olbrich (2012), well-educated, with only 28% not having tertiary education. Some 15% had learned a trade, while 57% had a tertiary-level qualification. In contrast, in our sample, 36% of household heads had not finished primary school, 41% had completed secondary school, and only 23% held a post-secondary technical or university qualification. We control for various aspects of socio-economic attributes in our model. We control in our analysis for the players’ total marginal farm income per year (including investments), age, gender, and three dimensions of human capital. We consider the education level and the cumulated time of participation in farm trainings. A3 – History of past experience By 2008, the beneficiaries in our sample have been granted access to their farming units between 1 and 23 years prior. We control for the period of time from when the players received access to their land as a proxy for their farming experience. A4 – Location Some 58% of the heads of households in the study sample were full-time farmers who spent the entire year on the farm. The remaining part-time farmers spent an average of 74 days a year on the farm. 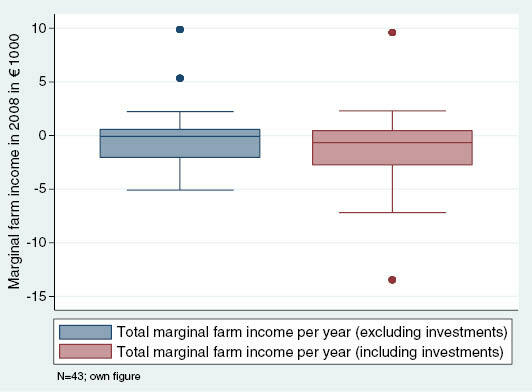 The effect of full- or part-time farming is considered indirectly by assessing non-farming income (part-time farmers are usually employed or have businesses). In the following section we present some theoretical considerations related to the challenge of water provision cooperation in Central Namibia. The payment systems most commonly used by the farmers are either payment per farmer or per head of livestock. Our model aims at drawing theoretical hypotheses regarding farmers’ contributions and free ride incentives in the management of water infrastructure. In real life, the maintenance costs of water pumps vary from year to year and are unknown to the farmers. The aquifer water is not scarce and the farmers do not face strong rivalry in water consumption. Despite the uncertainty of the maintenance costs, the farmers always have a watering opportunity for their herd. They can use their own water infrastructure, as long as their own pump is operational, or they use alternative water sources, e.g. on neighbouring farms. Therefore, actions and processes which change livestock numbers are neglected in our theoretical analysis. In addition, we neglect any other costs such as production costs. Proposition 1: a group or a farmer will contribute for the maintenance of their water infrastructure, if the group or the individual participation condition is fulfilled. When a short-sighted strategic farmer i computes her optimal decision, neglecting future interaction and not holding other-regarding preferences, she takes the contribution of other farmers as given. Any additional payment of farmer i will increase the survival rate of the water infrastructure which is beneficial to all farmers in the cluster. If farmer j raises her contribution, farmer i will strategically reduce her contribution to the group water fund. This behaviour conflicts with the inequity aversion concept of Fehr and Schmidt (1999) and conditional cooperation of Fischbacher and Gächter (2010). Propositions 2 and 3 predict that poorer farmers, in terms of livestock, will expect wealthier farmers to contribute more to the water fund. An equal payment would deviate from the optimal reaction function, thus, from the equilibrium, when livestock numbers are unequal. From Propositions 2, 3 and 4 it follows that heterogeneous groups, in terms of livestock endowment, are, in equilibrium, more likely to choose the rule payment per head of livestock. Acknowledging the complexity of social ecological systems initiated the debate on how to decide which variables should be included in particular studies. Catalogues of third tier SES framework variables collected from various studies quickly contain hundreds of variables. There is a common understanding that only such variables should be selected which are relevant for a particular study. The explorative SES assessment helped us to identify relevant control variables. Without formalising we had implicitly theories in mind when selecting the controls. Especially for the quantitative analysis another criteria has been important. We included only such variables in our analyses which show a considerable variance across our sample. With our study design we cannot make any statements about the importance of features of the SES which are identical across our sample. Such variables can still have a strong impact on cooperation patterns. Good examples are historical or political factors. We provide in the introduction and in Appendix 1 some context information on such variables. This has implications on the interpretation of our results. Our models explain cooperation behaviour given that our sample has been exposed to the same history and policies. This Appendix describes the combined ecological-economic model that has been used for the role-plays. The descriptions already include all adaptations that are needed for the interactive application. A detailed formal description of the applied sub-models can be found in Tietjen et al. (2009), Tietjen et al. (2010), and Lohmann et al. (2012). The model described here is also published in Lohmann et al. (2014). We use a combined ecological-economic model to simulate rangeland management during the role-plays. A farm sub-model simulates animal herd dynamics, different fixed and variable costs and allows for interactive trading of livestock. A vegetation sub-model simulates the dynamics of a semi-arid savannah based on a state-and-transition approach (Westoby et al. 1989). In the following, we first describe how we generated the transition probabilities for the vegetation- sub-model by means of simulations with the established high-resolution eco-hydrological model EcoHyd (Tietjen et al. 2010; Lohmann et al. 2012). Further, we describe in detail the structure and rules of the interactive farm-scale ecological-economic model that we used for the interactive and simulation-based experiments in the field. Vegetation dynamics Landscape scale vegetation dynamics were simulated using the state-and-transition approach (Westoby et al. 1989; e.g. Popp et al. 2009). The underlying transition probabilities were derived from vegetation dynamics simulated with the eco-hydrological model EcoHyd (Tietjen et al. 2010). Following the idea of the state-and-transition concept, we first defined ecological states between which the semi-arid savannah can switch, and then we identified probabilities for the transition between these states. The definition of the vegetation states was exclusively based on perennial grass and not, for several reasons, on woody vegetation cover or annual grasses. First, perennial grasses are the vegetation type providing the desired fodder biomass for livestock and, are thus, most important from a land user perspective. Second, perennial grasses respond quickly to changes in seasonal precipitation and livestock densities, while woody vegetation responds on the scale of decades (see Lohmann et al. 2012) and annuals respond directly to the presence or absence of the two other types (e.g. Lohmann et al. 2012). Consequently, as we want to simulate only 10 years of land use in the role-plays, an inclusion of woody vegetation is not necessary. Further, a simple description of the ecological states is important for a clear communication of the model’s state to the participants during the role-plays. We defined four vegetation states and five classes of precipitation that are given in Table A3.1. We conducted 100 repeated simulations of 100 years for each of 13 different grazing intensities (2–26 ha LSU–1). Every single simulation had a unique stochastic time series of precipitation (see Tietjen et al. 2010; Lohmann et al. 2012). In every time step, the change of the average cover of perennial grasses (on the simulated 2.25 ha grid), the respective seasonal amount of precipitation and the biomass of annual and perennial grasses was recorded. This resulted in 65 transition probability matrices (for 13 different grazing intensities and 5 classes of seasonal rainfall intensity) and 4 regressions (one per vegetation state) for both annual and perennial grass biomass production as a function of rainfall. Finally, vegetation dynamics and biomass production are stochastically simulated with the state-and-transition approach for a grid of variable size (depending on the interactive initialization at the beginning of the role-play) with a cell size of 1 ha in annual time steps. In the following we describe the processes accordingly. All model rules have been discussed, in several feedback sessions and model test runs, with members of the Namibian Emerging Commercial Farmers Support Programme (ECFSP) and rangeland experts from the MAWF research station at Sandveld. Rules are based on the recommendations of the joint presidency committee (JPC) of the Namibia National Farmers Union (NNFU) and the Namibia Agricultural Union (NAU) who developed management guidelines for the ECFSP (Stehn 2008a,b). The model implementation allows for interactive decisions regarding cooperation in water-infrastructure maintenance between several farmers. During the role-plays participants were also able to contribute to group water funds. At the beginning of every role-play, a few parameters and the state variables of the model need to be initialized. Therefore, every player needs to input the type of farm with regard to the land reform measure, the size of the farm, the number of animals kept, the number and type of water pumps run on the farm, the number of farm workers employed and the salary paid for them. After the input of this basic information, the composition of the cattle herd and the state of the vegetation (see Table A3.1) are initialized. We assumed a moderate to good condition of the on-farm vegetation and randomly set the vegetation state in each cell to state 1 or 2 with equal probability. The animal herd was composed assuming good management. This resulted in a herd of mainly young animals in good condition (see initial age class distribution in Table A3.2). Further we assumed the herd to consist of mainly fertile adults (56% cows and 4% bulls), 10% oxen, 10% heifers and 20% weaned calves (weaners). This composition represents a fertile breeding herd and allows for a quick adaptation of the management to either a cow/oxen- or weaner-production strategy. Age class definition and age dependent parameter values. Based on the current vegetation state and the rainfall of the current season, the model calculates the biomass production of perennial and annual grasses for all cells according to the linear relation derived in the up scaling process. In order to reduce the complexity of the role-plays, the number of bulls is automatically adapted on an annual basis assuming that at least 1 bull is always available per 25 cows (as recommended in Stehn 2008a). Bulls are taken from male weaned calves (weaners). We categorized the animals’ condition from “very lean” to “fat” according to a scoring system that was developed by the Emerging Commercial Farmers Support Program of Namibia (ECFSP). The score of an animal relates to its nutritional condition and more specifically to its body mass (Table A3.3). Definition of condition score of animals. where wLSU is the mean weight per LSU (450 kg) and NLSU the current number of animals in LSU. For example, during the first 120 days of a year (late rainy season from January to April) the animals will feed with a rate of rin if biomass availability enables at least a rate of 1% of their body mass for the rest of the year (245 days from May to December). By this, we achieve the typical seasonal changes in body mass that the animals undergo (Tainton 1999) and simulate body score dynamics that are part of the output that is given to the farmers during the role-play. where bm is the biomass of an average animal, gr the potential growth rate of an animal and bmmax, the maximum body mass of an animal. For rates below rin,lim, animals start losing weight according to a linear relation leading to a daily weight loss of max 0.2 kg per day if the available fodder biomass only allows for an intake rate of 1% or less. Animals are assumed to starve whenever the average body mass is <220 kg. In times of very scarce fodder resources, the model will reduce animal numbers so that surviving animals will at least have an average body mass of 220 kg. Note that this is an extreme case which will only occur under very extreme conditions. We assume one single breeding season per year (early winter breeding season). Consequently, calves are born in the second half of the rainy season. Weaning takes places after 9 months; at the end of the dry season/beginning of the rainy season. Conception and weaning are stochastic and depend on probabilities which in turn depend on the animals’ condition score and are given in Table A3.4. Parameters depending on animal condition score. Every individual animal experiences stochastic mortality on an annual basis. The probability to die depends on the condition score of the herd and is given in Table A3.4. At the end of a year, the average size of the herd that was feeding on the farm during the year is used to calculate the changes in vegetation state for the next time step. Together with the total seasonal precipitation, the stocking rate can be used to identify the respective transition probability matrix from the matrices produced during the up-scaling procedure (see above). Then the transition of the vegetation in every cell of the vegetation grid is drawn by chance. According to interviews with experts and farmers from the ECFSP and the Sandveld research station as well as data from both sources, we derived all-inclusive costs of the farming business. The costs are split in two categories: fixed costs, which are calculated on the basis of farm size and variable costs that are related to the size of the herd. Accordingly, a minimum amount of costs are fixed and will always incur irrespective of the herd size (i.e. costs corresponding to a herd size of 25 LSU). In addition to these costs, we calculate the expenses for water-infrastructure maintenance and labour according to the respective on-farm setting. Half of the costs have to be covered at the end of rainy season and the other half after the second time-step at the end of the dry season. In this way, the participants of the role-play will know the costs when they are requested to make their livestock trading decisions. Costs are automatically deducted from the individual’s bank account. In the game, each player has an individual bank account. We calculate credit and debit interest at annual rates of 15% and 2% respectively. At the beginning of the game the account balance is zero. During a one year simulation, the role players have the opportunity to interact with the model at two stages. The participant is requested to make a decision: what amount of what kind of animals to buy or sell. The categories of animals are oxen, cows, heifers and male and female weaners (weaned calves). Animal prices depend on the age and condition of an animal (see Tables A3.4 and A3.5). Selling prices are below purchase prices and prices in September differ from prices in April (see Table A3.5). Whenever animals are sold, older animals and cows that are not pregnant and have no calf with them are preferentially sold. Prices have been defined according to the 2008 prices7 at the livestock auction in Gobabis, the capital of the Omaheke region. We assumed constant prices for the duration of the simulation experiment. Revenues from livestock sales are automatically saved on the individual’s bank account and expenses for livestock purchases are deducted from it. In the context of FURS, the government commonly buys larger farms (> 5000 ha) and splits them into smaller farm units (app. 1000 ha) which are allotted to the applicants. The big farms usually have a centralised water infrastructure with few pumps and pipes. As a result not all FURS beneficiaries have access to their own pump or dam and the group of beneficiaries sharing the formerly larger farm have to maintain the infrastructure jointly. We replicate this situation in the role-play. In the role-play the groups of farmers who share infrastructure in real-life play the role-play together. The group is given one diesel and one wind pump which they need to maintain together. The maintenance costs for the group are randomly distributed. On the basis of expert interviews, they are set to, on average, N$ 2350 (σ=785) for the diesel driven pump and N$ 750 (σ=250) for the wind driven pump. Farmers are not informed about the periods’ water costs before making their contribution and, therefore, have to make decisions under uncertainty. The maintenance costs are automatically deducted from a group account. Each of the players has to decide individually, every role-play year, how much she wants to pay into the group account from her individual role-play account. In the case that the money available in the fund is sufficient to cover the maintenance costs, no further consequences follow. If it is insufficient, the infrastructure breaks down. In reality, the farmers usually take their cattle to the neighbouring farm where they have to pay for getting access to water. We assume a hypothetical fee of N$ 50 per head of cattle which is based on interviews with farmers even though the amount strongly varies in reality. The fee is automatically calculated by the model and deducted from the individual bank account. If there is more money in the group account than needed to cover the maintenance costs, the amount will be saved there and can be used to cover water costs for upcoming role-play periods.